While our nine-parish region is a crucial hub for Louisiana, opportunities exist to improve and enhance our infrastructure assets to better compete to attract business, talent, and, investment opportunities. 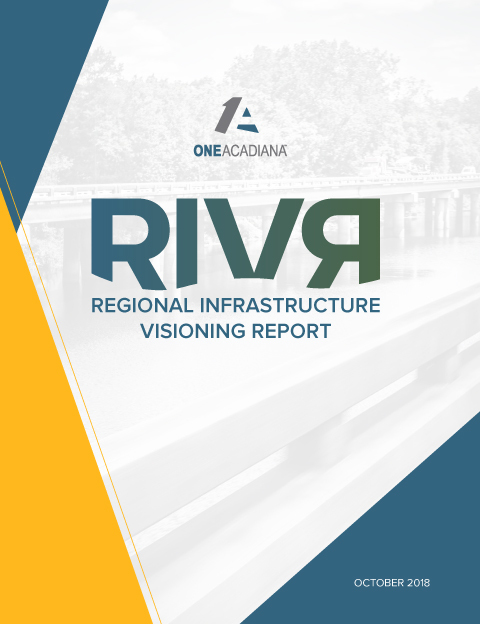 1A has developed a Regional Infrastructure Visioning Report (RIVR) to identify and align on Acadiana’s most pressing infrastructure needs. The 21 projects included in the RIVR were deemed by the regional business community as critical to economic vitality, quality of life, and regional competitiveness in Acadiana. Click the image above to download the RIVR. 1A is committed to engaging on and advocating for completion of these projects. Infrastructure is critically important to Acadiana’s quality of life, the health of our regional economy, and our ability to compete with other regions to attract high-quality businesses and talent. The RIVR provides the business community’s blueprint for achieving infrastructure goals that will keep our region moving forward. The RIVR serves as a tool for Acadiana’s business and economic development community to communicate our support for priority projects, leveraging our collective voice and maximizing our advocacy efforts to make progress on our region’s critical infrastructure needs.